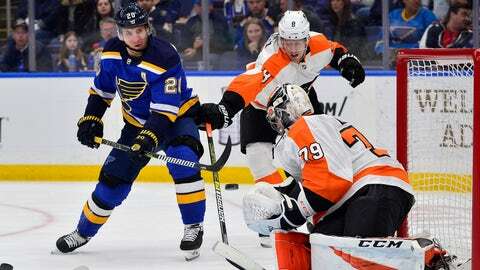 Alexander Steen scored twice in the Blues' victory over the Flyers on Thursday night. ST. LOUIS — Alex Pietrangelo isn’t quite sure how the St. Louis Blues turned their season around. Ivan Barbashev, Ryan O’Reilly, Steen, Pat Maroon and David Perron all scored during the early outburst as the Blues scored five times on their initial eight shots on goal. St. Louis is one point behind first-place Nashville, which has 98 points after beating Vancouver 3-2 on Thursday night. The Blues are tied with Winnipeg for second with 97 points. The Jets lost in overtime to Colorado on Thursday, so the Central title will be decided Saturday as all three teams close the regular season.